Club Penguin Cheats by Mimo777 Club Penguin Cheats by Mimo777: Rainbow Puffle Quest Update! Looks like lots of penguin are transforming into their NEW Rainbow Puffles on Club Penguin! We asked... and they listened! 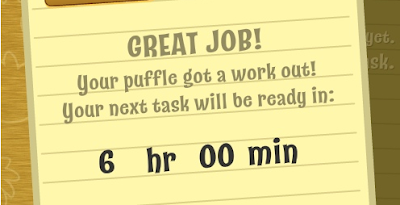 Starting tomorrow, it will take less time to complete the Rainbow Puffle quest. You'll only need to wait 6 hours between steps once this update happens. That's 3 times faster than before! And also, if you dont have time to get a Rainbow Puffle during the party, no worries! You will still be able to adopt a the new puffle after the party! I name all my puffles after Pokemon. There's Buizel the orange puffle, Entei the red puffle, Raikou the yellow puffle, Suicune the blue puffle, Pikachu, another yellow puffle, Serperior the green puffle, Skitty and Delcatty the pink puffles, and Eevee the brown puffle. I also have Mimo the orange puffle. I found a glitch! If you have EPF : Herbert's Revenge for NDS, and you enter the code inside, then you get acess to a special puffle named Flare. But if you walk him and go to the Puffle transformer in the Ski Lodge, the site will ask you to choose a puffle. When you choose the puffle, you'll be in the Play Zone as a penguin walking Flare!